Our Scrapper’s Guide readers are an exceptionally creative and clever group of people. When subscriber Myra suggested that we offer a template to create your own newspaper, we thought it was a terrific idea! We think you’ll love her wonderful idea, too! 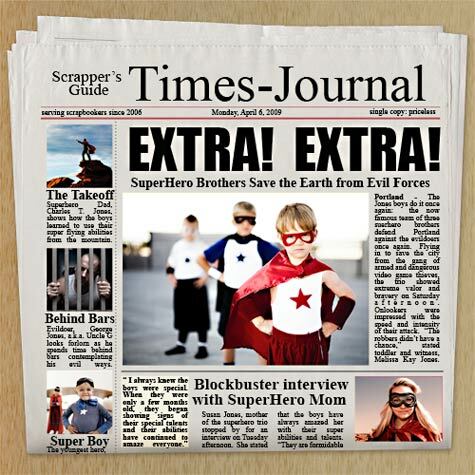 Download the free layered template and follow the directions for creating a one-of-a-kind scrapbook page with a personalized newspaper image. 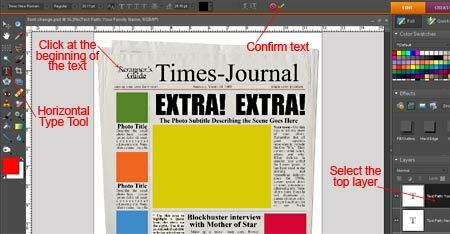 Begin by downloading and unzipping the Scrapper’s Guide Newspaper Template here. We used Impact font for the headline and Times New Roman font for the text and titles. Check your system to make sure you have both Times New Roman and Impact fonts loaded. These are common fonts that come installed on most computer systems. Download and install fonts if necessary. Here are free alternative fonts that can be substituted. Open the template and five photos in PSE. If Times New Roman and Impact are not loaded on your computer system, you will receive a font error upon opening the template stating the some text layers contain fonts that are missing. Click OK to allow PSE to substitute the font. 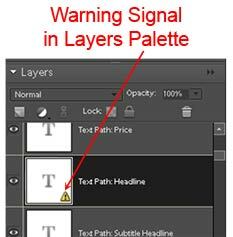 In the Layers Palette, you will see a warning sign on the thumbnail of each text layer that lets you know the font used in the template is not available on your system. You can safely ignore these warnings until you replace the text. If the fonts are loaded on your computer, you will not see these warnings and can continue to the next step. Select the Horizontal Type tool, then select the top layer named “Text Path: Your Family Name” in the Layers Palette. Click and drag over the text to highlight the entire phrase. Type your own text such as your family name. PSE will follow the text path in the template as you type. Click the green checkmark in the Options Bar to confirm the new text. Still using the Horizontal Type tool, select the second layer named “Text Path: Newspaper Name” and highlight the newspaper title, “Times-Journal.” Type a new name of your choice. 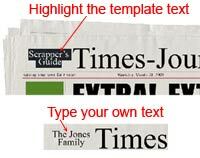 Repeat the steps to replace all of the titles and text on the newspaper template. If the template fonts are not loaded on your computer, an error message will appear when you highlight the text stating “The following fonts are missing for text layer …”. Click OK to allow PSE to choose a suitable font substitution. With the text highlighted, select a font from the drop-down menu in the Options Bar, then type your new text. Get creative with the new text, adding funny quotes and interesting details for your newspaper stories. The colored blocks on the template are photo placeholders. To place your own photos in the blocks, begin by selecting the yellow box layer in the Layers Palette. This layer is named “Large photo right side” with a yellow block in the thumbnail. Double click the photo in the Project Bin that you would like to place in this space. This makes the photo large in the editing window. Click and hold as you drag the photo down onto the template in the Project Bin. When your cursor is directly over the template thumbnail in the Project Bin, let go of the mouse. The template will become the active item in the editing window and the photo will be a new layer in the template. Click and drag the photo directly over the yellow block, covering the block completely. Make sure that the photo layer is positioned directly above the yellow block layer in the Layers Palette. If it isn’t, drag the photo layer up or down the palette until it is positioned on top of the yellow block layer. Resizing the photo: Make sure Show Bounding Box is checked in the Options Bar. To make the photo larger, drag the cursor to the corner of the photo where it turns into a diagonal arrow. Click and drag toward the center of the photo to make the photo smaller. Click and drag away from the center of the photo to make the photo larger. When you are happy with the size of the photo, press Ctrl + G (Mac Cmd + G) to “group” the photo layer with the yellow block layer. The photo will take the shape of the yellow block. Repeat the steps with the remaining colored blocks to fill them with your own photos. 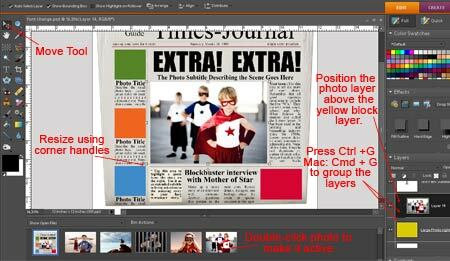 You can also use the same steps to replace the background with a piece of digital paper or a large photo. 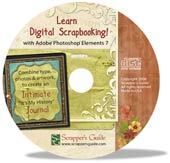 If you're new to digital scrapbooking, our video training CD, Learn Digital Scrapbooking! 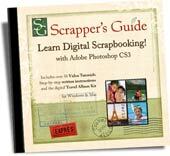 by Linda Sattgast will take you from rank beginner to confident digital scrapper. Save 10% on all other orders from the Scrapper's Guide store! Click here to try a free issue! All content and imagery © 2009 Scrapper’s Guide. All rights reserved.